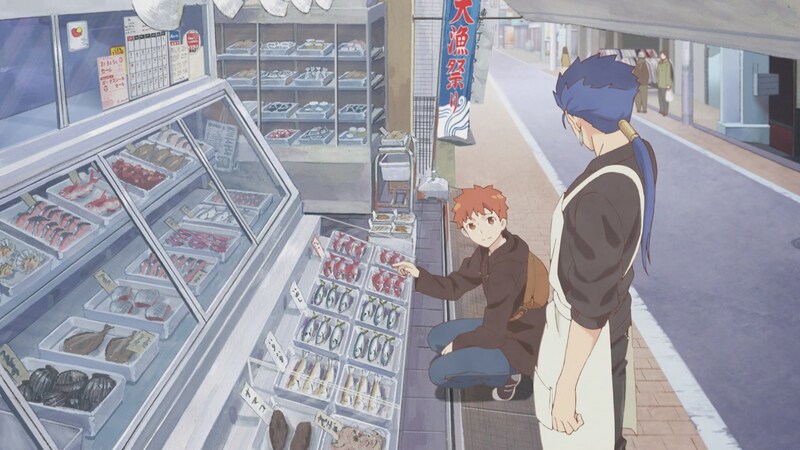 Seeing the prices for fresh fish in Japan makes me want to live in Japan. 98 yen per filet? My gosh. 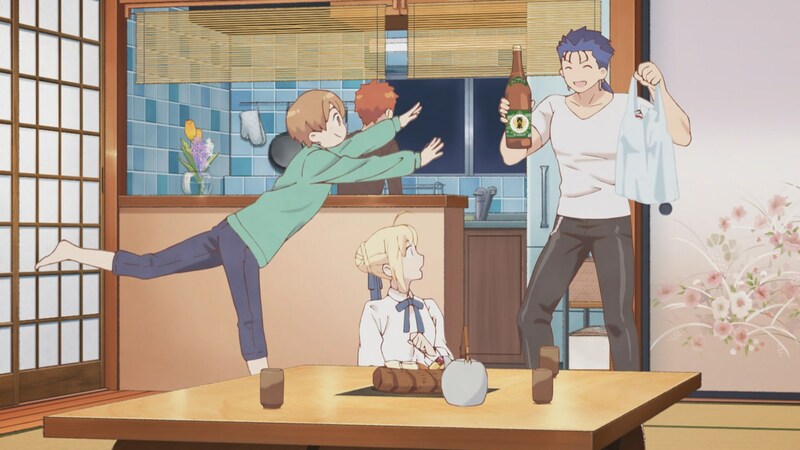 Gotta love how Lancer just bros his way into the Emiya household. 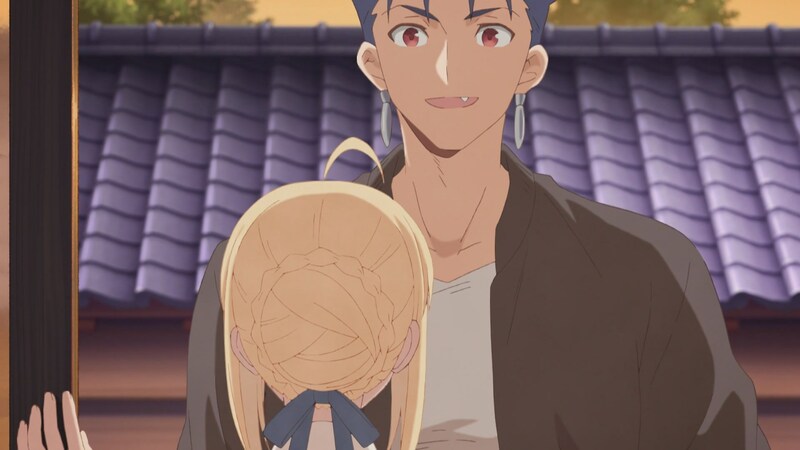 Also, I didn’t realize there was such a height difference between Saber and Lancer. She would also be standing on the stepped up floor too. Okay now for the meat of this post. 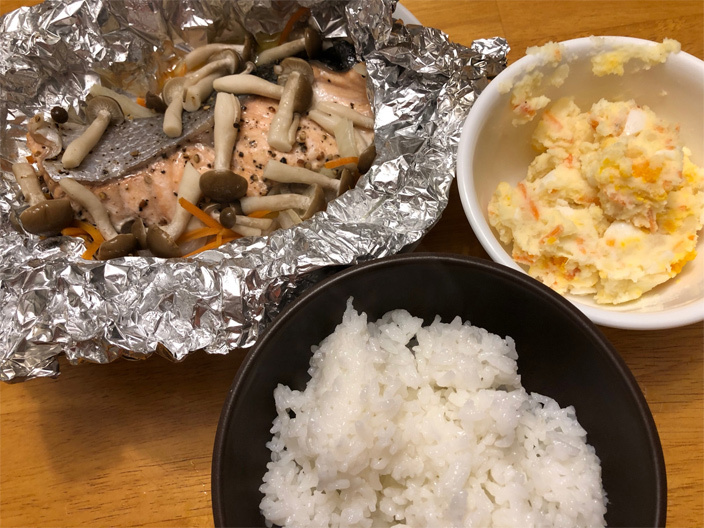 One of my go-to dishes for dinner is simple shioyaki salmon. 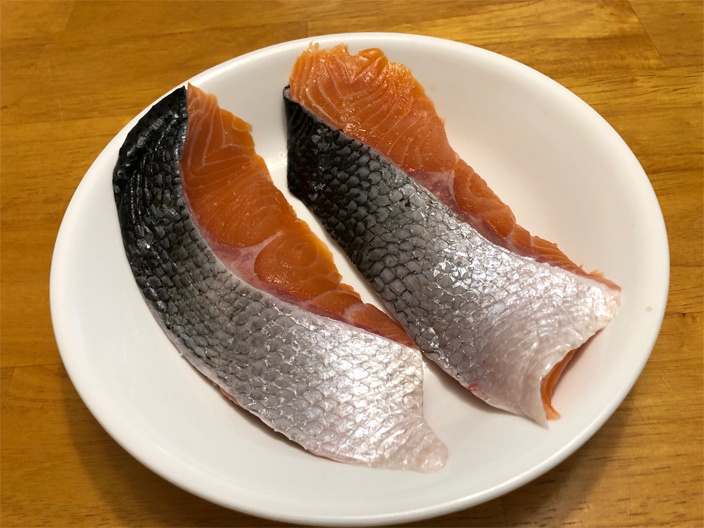 I can get reasonably fresh Japanese salmon fillets from all the Japanese markets around me, and it’s quick, easy, delicious, and healthy. 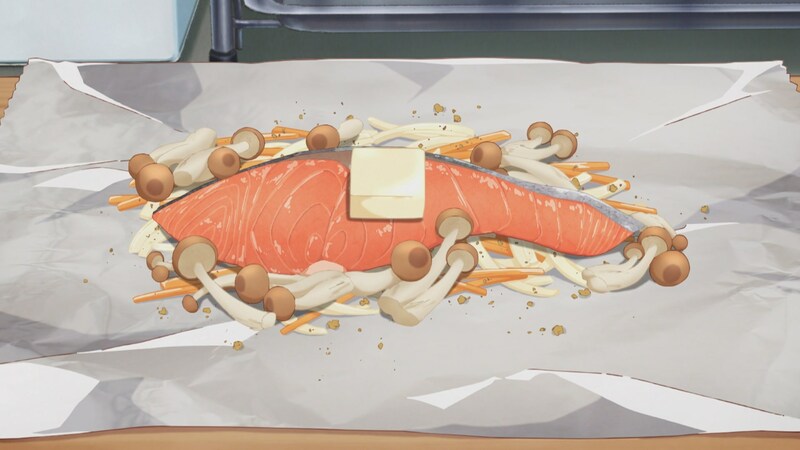 So when I watched this episode of Emiya-san, I wanted to try out Shirou’s steamed salmon in foil recipe. Steaming fish is generally hard to get just right. 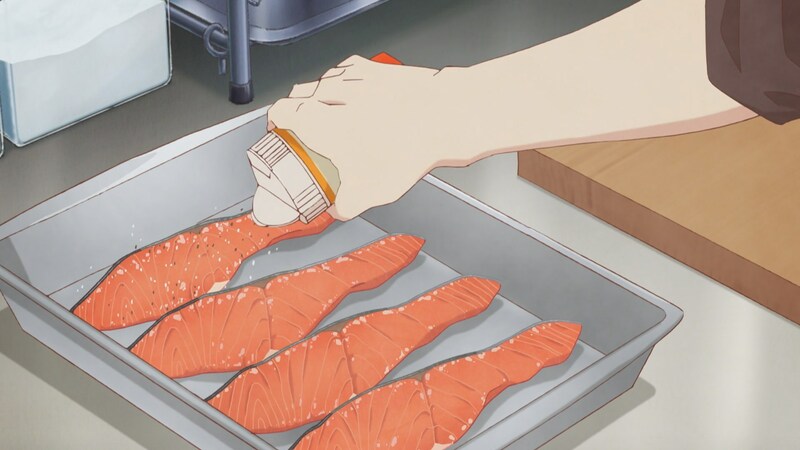 I started with two cuts of Japanese filleted salmon which cost a lot more than what Shirou paid. I prefer Atlantic salmon over sockeye for dishes like this one. Sockeye is a bit heavier and fishier in taste and is generally better for onigiri and jerky. I dabbed a little sake on them and salted both sides. I then wiped them with a paper towel. Here, they are marinating. Shirou suggested 5-10 minutes, and I left it out for the full ten since I was prepping to make potato salad at the same time. I cheated a bit. 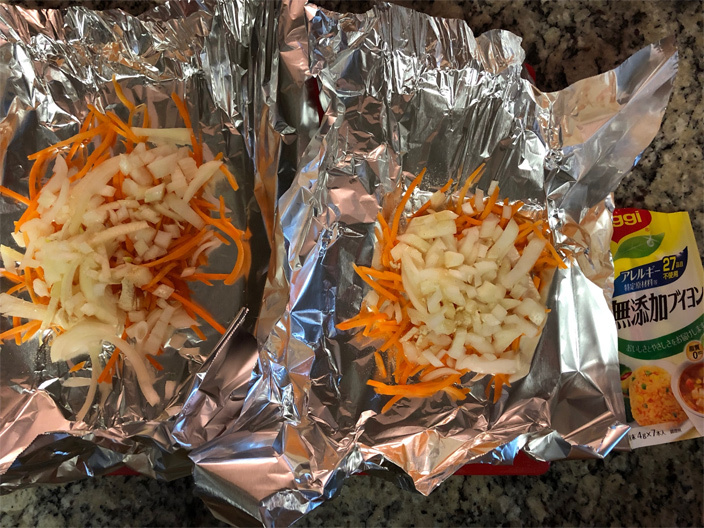 I used carrots pre-cut for salads and combined that with half a sliced onion. For whatever reason, the Japanese supermarkets here like to sell carrots in shrinkwrapped packages. I don’t really need three large carrots. So I bought the pre-cut carrots instead, and I’ll use the carrots also in the potato salad. I sprinkled some powered vegetable bouillon on top. I have no idea how different this bouillon is compared to Shirou’s consomme. The grocery story didn’t have a large selection, and it was basically this bouillon or a seafood version that was twice as expensive. 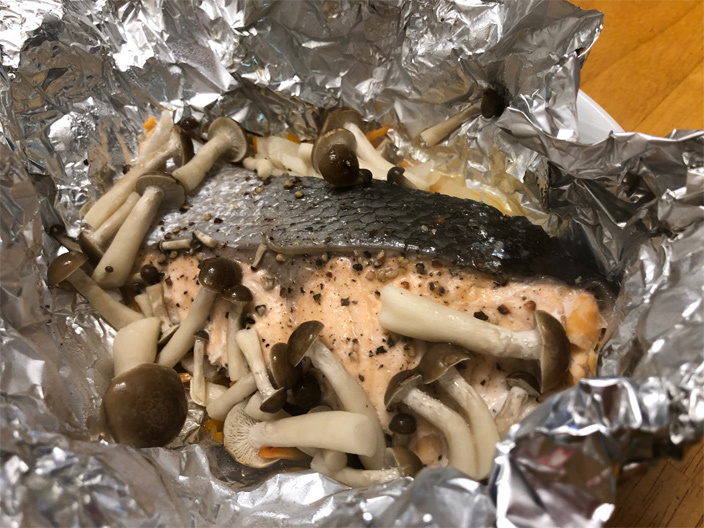 After putting some more salt plus pepper on the salmon, I put it on top of the veggies and also covered it with the shimeji mushrooms and a dab of butter. I put them in a pan to steam much like Shirou. At this point, I had the salmon cooking, the potatoes boiling, some eggs cooking, and yams baking. I had four timers going on at the same time. And 17 minutes later, ta-da! Salmon has a good color, and it smells wonderful. 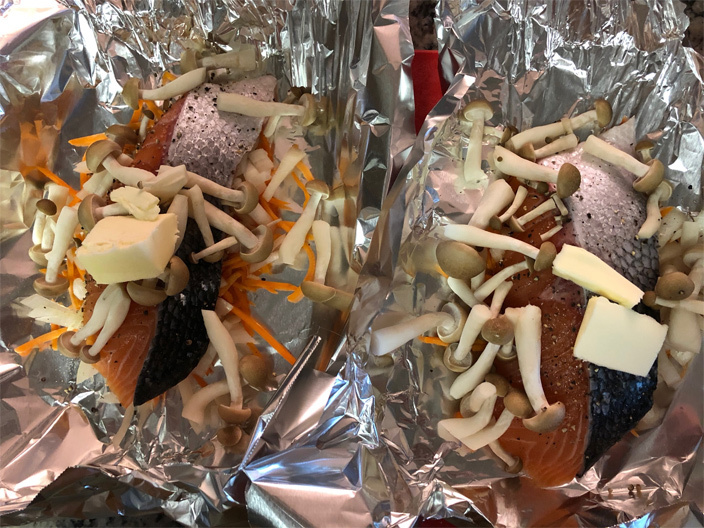 Another good thing about this recipe is that the salmon is wrapped in foil so it stays hot. I needed about another three minutes here to finish up the potato salad. Sorry, I’m not a food blogger, but here’s the finished meal. I decided on potato salad for the side dish because that looked like one of the sides Shirou cooked plus we still had some kewpie mayo in the fridge. I was hungry and just snapped photos as I was cooking while trying to avoid tripping over my puppy who was intent on trying to trip me so I would drop food for her. She ended up with some carrot pieces. The salmon turned out great. It was perfectly steamed. Mushrooms were very tasty as well. The meal went well with the rice and potato salad. I think next time I’ll use slightly less onions and a bit more salt. This recipe is fairly easy, and Shirou’s explanation is simple and straightforward to follow. I think the only tricky part is finding the right consomme, but I’m sure any powdered stock would work. 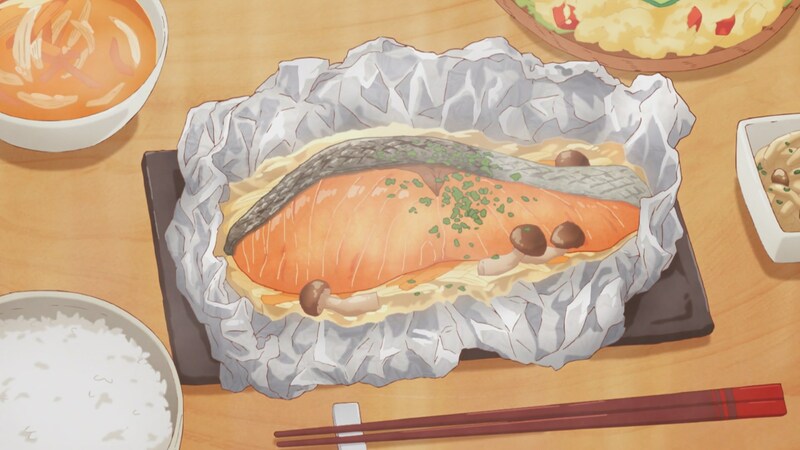 I would recommend Shirou’s steamed salmon in foil to anyone who likes salmon or just want a simple, healthy dinner. Just don’t put too much of that delicious butter/stock sauce on your rice. Shirou’s money shot. I forgot about the parsley, which is just as well since it’s expensive, and I couldn’t use it for any other dish this week. I would totally watch a Wakako-zake-type show about Taiga-sensei and Lancer going out for drinks and food. 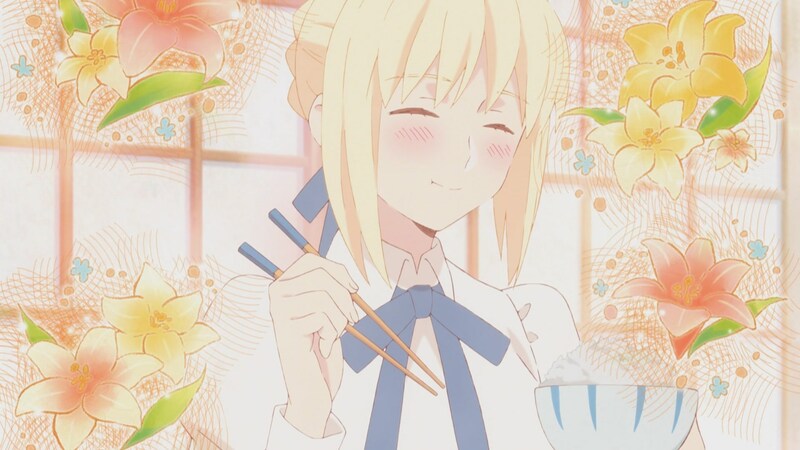 There’s so much general misery in the Fate universe that seeing the characters happy is always welcome. i didnt expect someone would really try to cook shirou’s recipe. base from you pictures, it looks delicious. i might as well give this a try. the dish is not complicated.